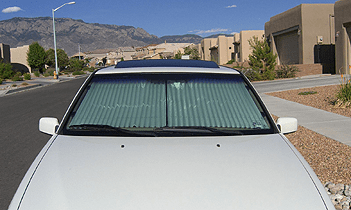 A small investment to protect a large investment… Sunshades from Denver Window Tint. We all know what the summer sun means for you and your vehicle – damaged interiors and unbearable heat. If you own a car, truck or van and live in a place that has as many sunny days as we do, then you need the Sunshades from Denver Window Tint. Our sun shades are the original retractable and self-storing car, truck and auto windshield shade. While there are a number of imitation car, truck & auto window sun shades, none of them provide the same level of coverage and durability. Not only is this the best shade on the market, it's one of the best car, truck or van accessories you'll ever purchase! 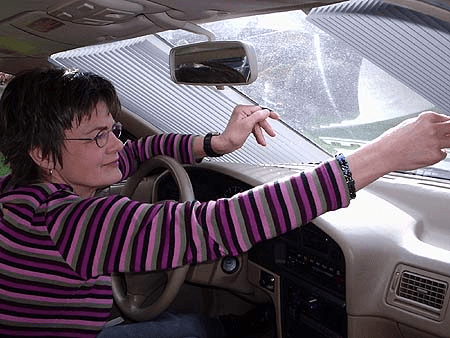 All Sunshades are custom fit to your vehicle windshield. In order to determine which sun shade is best for you we need to know the year, make, model and body style of your car, truck or van. If you have a vehicle, chances are we have a Sunshade for you.